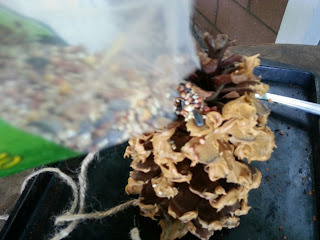 My daughter Lacey is forever on a nature hike, while we were doing our 3 mile March for Babies walk, she managed to find giant pine cones for everyone to take home, luckily we had a backpack to carry them. 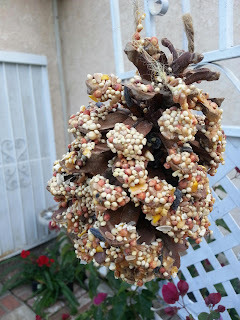 Anyway, I knew we had to put them to use, so we turned them into bird feeders! 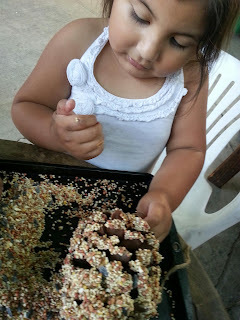 I don't know where I've seen this before, but it was really easy, and fun for the girls! 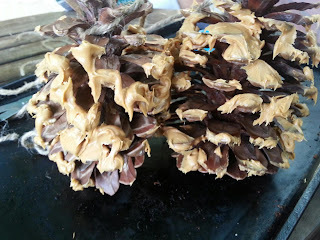 I recommend this activity for kids of all ages. 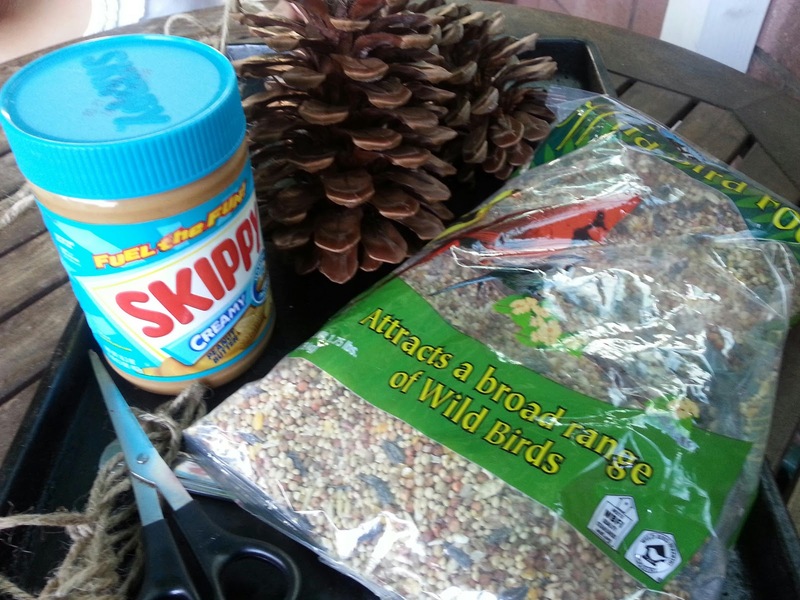 Supplies needed are: Pine cones, bird seed (from the dollar store),peanut butter, string and a tray to catch all the seeds. 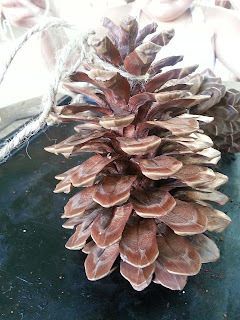 First, we tied our string or twine to the pine cone. Next, I poured the seed over the pine cones and let the extra gather on the cookie sheet. 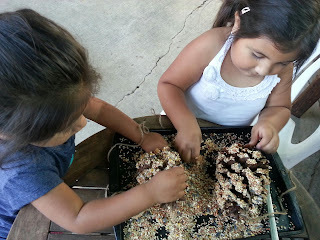 Here are the girls covering the pine cones in seed. 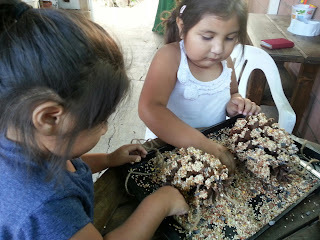 This was the girls favorite part, getting their hands dirty. They did a very thorough job! Finished pine cone. We hung this one under a tree. 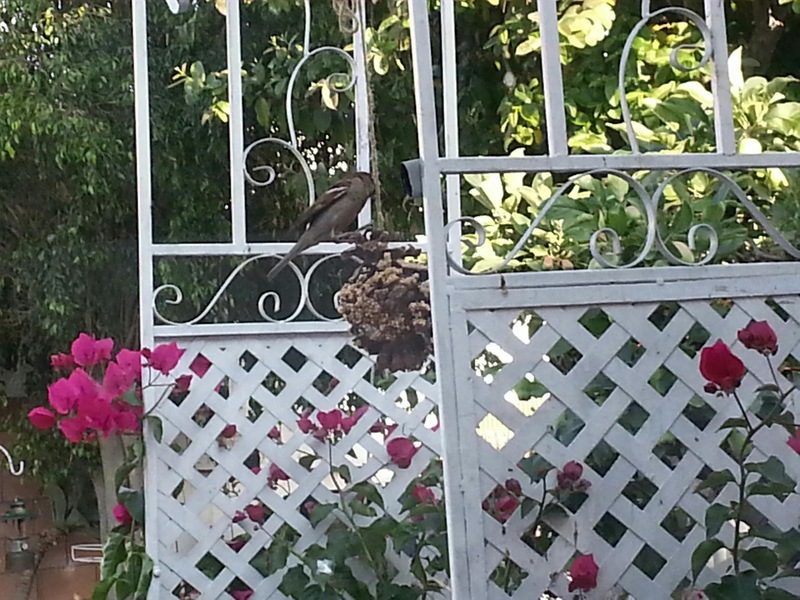 3 days later, we were sitting in the kitchen and Lacey spotted this bird through the window! We were all so excited, I admit, I may have been a bit more excited than the girls. 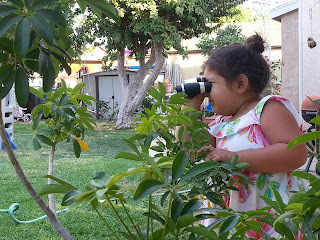 Here is my daughter bird watching! Hahaha, I love catching moments like this! She takes these types of things very serious. 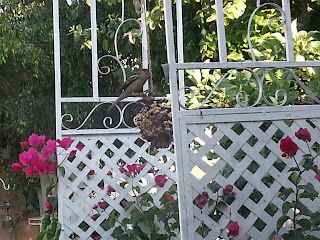 And while we were bird watching, we saw this! 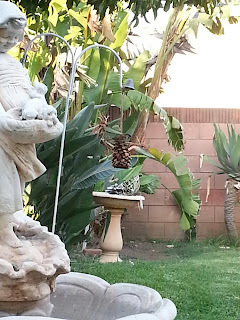 Another bird on the other pine cone. 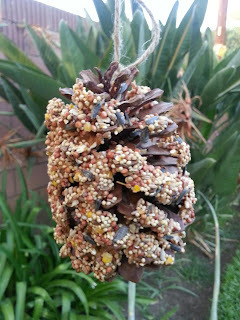 This was a really fun activity that took 10 minutes to create, and lasted a week while we kept an eye on all the birds. Have you ever done this activity? What are some other outdoor activities to do with young children? Please share, I'm always looking for new ideas and adventures for me and my little ones! Thanks for reading!